Halfords Retail – more than 460 stores in the UK and ROI where you’ll find everything bike, car, audio and leisure related. Our in-store ‘We Fit’ service carries out minor repairs, installations and maintenance for cars and bikes. Halfords Autocentres - more than 300 Autocentres where you can get your car fixed, serviced or MOT’d. Halfords.com – which currently makes 12% of our retail sales with customers ordering for store collection or home delivery. Support Centre – in Redditch, Worcestershire, supporting all of our store operations nationally. 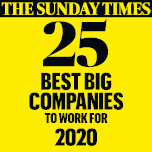 And just to add to this success, for the fourth year running we’re in the Sunday Times ‘Top 30 Best Big Company to Work For’. That’s because we know people are the heart of our success. We’ve created a culture of engagement where people enjoy their work and positively thrive in their career progression. If you think you’ve got what it takes, check out our Commercial, Finance, IT and Retail schemes here.